It looks like we may be in for a reprieve from the heat this Saturday, that will be much welcomed. 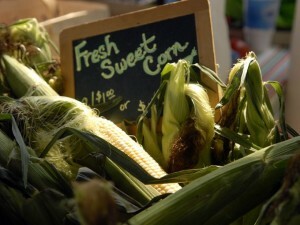 We will have plenty of summertime favorites… sweet corn and home grown tomatoes. We’ll also have beets, cucumbers, kale, Swiss chard, cabbage, zucchini, yellow squash, bell peppers, green beans and new potatoes. Kenny will be bringing plenty more candy onions, cherry tomatoes, a few hot peppers and his various eggplants. Peaches are ripe for the picking and would make a great cobbler for this weekend’s dinner. 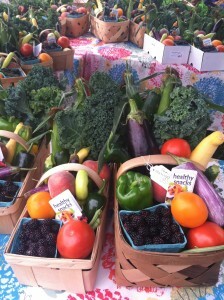 We hope to more blackberries and cantaloupes this Saturday. Our popular watermelons – “Black Imagination” will also be available Saturday. We are still offering our “Baskets of the Week” every Saturday. If you are in need or want one please email me by noon Friday, val@russellveggies.com. The prices will remain the same as last year…$16 for the small ones and $32 for the half bushel size. It takes lots of planning to make these happen, they are done fresh Saturday morning and are pre-order only. Just a reminder that we have been selling out early… and don’t forget to pick up your farm-fresh, free range eggs while available.